All aboard! We're looking at 10 stunning bus wraps that will change how you look at public transport. Getting creative is one of the most effective ways a business can get their message seen. We've already seen how innovative billboard advertising can attract attention for miles around, but if you really want to stand out from the crowd, a creative bus wrap might be the solution. Here are ten amazing examples to inspire you. With their catchy "should've gone to..." advertising slogan, Specsavers are one of the leading brand names when it comes to glasses. This witty bus wrap ties into their brand message and is sure to stick in people's minds. If you need to get the bus to the airport, this clever wrap gives you an idea of what's coming next. When viewed from exactly the right angle, when the sky is its most sky blue, you'd almost be fooled into thinking you're watching a bus taking off. Or at the very least pulling an impressive wheelie. Litter can be a huge problem on public transport. When people aren't in their own car, it seems they don't mind dropping rubbish everywhere. To remind people to pick up after themselves, this optical illusion wrap turns the back of a bus into garbage truck. Let's just hope it doesn't smell as bad as the real thing. If you've got a shark phobia, this bus wrap might prove a little difficult to get on board with. Created for National Geographic magazine, this design features shark jaws printed on double doors that appear to swallow you up. 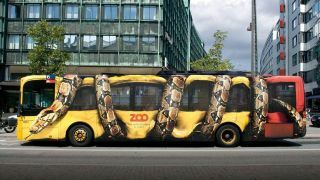 We're not sure if this wrap of a giant snake crushing a bus will put you off or encourage you to visit Copenhagen Zoo. Either way, it's a memorable design that is sure to stick in your head and generate word-of mouth enthusiasm. Another bus wrap for a zoo, another animal wreaking havoc. This time its Perth Zoo, who opted for a tiger for their distinctive advertisement. Luckily it looks like there's nobody in this bus, or it would be tea time for the tiger. Not all animal related bus wraps have to be deadly, however, as this design for a culinary festival shows. By turning the antenna on the top of the bus into part of the design, this bus really looks like it's ferrying around a giant crustacean. But does it come with a side order?